BlueStacks is a pretty cool app that we've been hearing about for a while, and it sounds like the development team has its eyes set on a new market: Windows tablets. Right now, BlueStacks allows users to run Android apps in MacOS (in alpha) and Windows (in beta), but it could be coming to Windows RT next year. The info comes from a comment in the BlueStacks support forum where BlueStacks employee Deepak Sharma said that the team is "considering offering BlueStacks for Windows R/T (sic) next year." If this works out, it would allow users to run any of the 700,000 Android apps on a Windows RT tablet. But, that's a very big if. Given the restrictions that Microsoft has placed on Windows RT apps, it seems highly unlikely that a BlueStacks app would be allowed on Windows RT. Of course, Windows 8 for tablets is expected to launch in January, so at least BlueStacks will already be available for use on those tablets through the legacy support. So if it runs android apps on Win 8 any chance of seeing it in WP8 sooner or later? 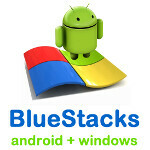 If bluestacks do manage to get windows RT to run Android apps, that would really be awesome. I enjoy bluestacks. However, one problem I am having with it is not being able to properly plan Temple Run. Before the issue was with its performance in it was terrible, they fixed the performance issue but now for anything that would require tilt its unplayable. Cant even get past the little tutorial thing due to this, lol, because you have to use the arrow keys on the keyboard, but it just keeps going. Works great with stuff like Angry Birds though.